The 2017 Nissan Titan XD is a modern pickup with improved towing and payload capabilities. It’s a unique truck with many benefits to offer compared to the competitors. It comes with a strong diesel option thanks to the brilliant engineering. This truck is a perfect solution to those who need to tow but don’t need a full heavy duty truck. Compared to the predecessor, it comes with improved technology, interior, exterior and performance. The truck also has other standard equipment. Having made its debut in 2015 as the 2016 model, it has managed to stay on course with better design and style. It’s also a perfect off-road vehicle. The Nissan Titan XD 2017 dimensions are 242.7 inches in length, 79.5 inches in width and 78.0 inches in height. It’s 14 inches shorter in length than the 2016 model. The cub comes with grille shutters that reduce the aerodynamic by 10% compared to the previous model. Titan XD has 20-inch alloy wheels and comes with a thicker steel frame. It has LED headlights as well as fog lights. It has a dark exterior trim with a variety of colors to choose from. The 2017 Nissan Titan XD is only available as a crew cub. It has 5 passenger seats. The front seats are covered with fine leather and are much more comfortable. The rear and the front seats are heated. Below the rear seats there are plenty of storage space .The steering wheel is covered with leather. It comes with a front and rear view camera and a 7-inch navigation screen. There is also a mobile app control system. In addition; it has a flat door for cargo that can be folded out. Further, it comes with storage boxes that are water tight. The tails gate works better since it lowers down compared to the previous model and is lockable. In addition, there are lights that illuminate the bed. It also has rear traffic alerts and blind spot monitors. It has a 12 speaker audio system with a DVD system. The interiors have a fine wood finish. It has a 6.5-foot bed. It comes with an engine immobilizer and a tire pressure monitoring system. Further, it’s equipped with an electronic brake and stability control system. It has a power steering power window. The 2017 Nissan Titan XD comes with two power terrains. There is a 5.6 liter V8 engine which is the standard size with 8-speed automatic transmission and the 5.0-liter Cummins V8 turbocharged diesel engine with 6-speed automatic transmissions. The 5.6 liter V8 engine produces 390 hp and 394 ft of torque. The 5.0-liter V8 diesel engine produces 310 hp and 555 ft of torque. It comes as a rear wheel drive which is the standard type or 4-wheel drive which is optional. The diesel V8 engine gets from 0-60km/h much faster since it’s perfect for towing. It has a maximum towing capacity of 11260 lbs and loading capacity of 2590 lbs. However, the off-road feature makes it consume more fuel. The major competitors are; Chevy Silverado 2500HD, GMC Sierra 2500HD, and Ford F-250 trucks. 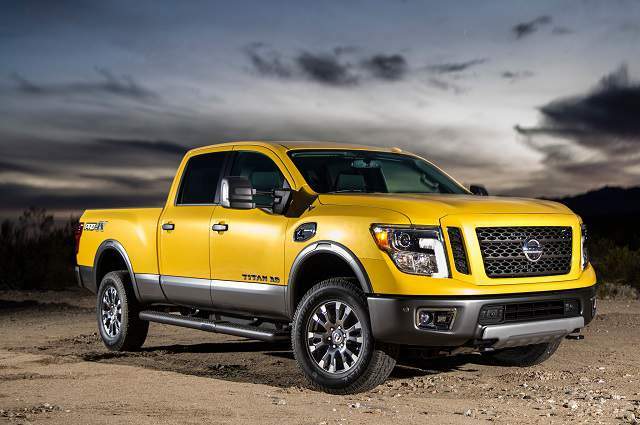 The 2017 Nissan Titan XD is expected to be in the retail market early 2017 with an estimated retail price of $37,000.